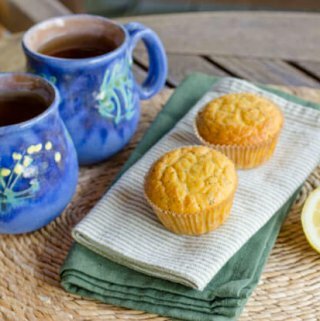 These 20 paleo desserts are the perfect way to add a little sweetness to your day without veering off course from your healthy lifestyle. 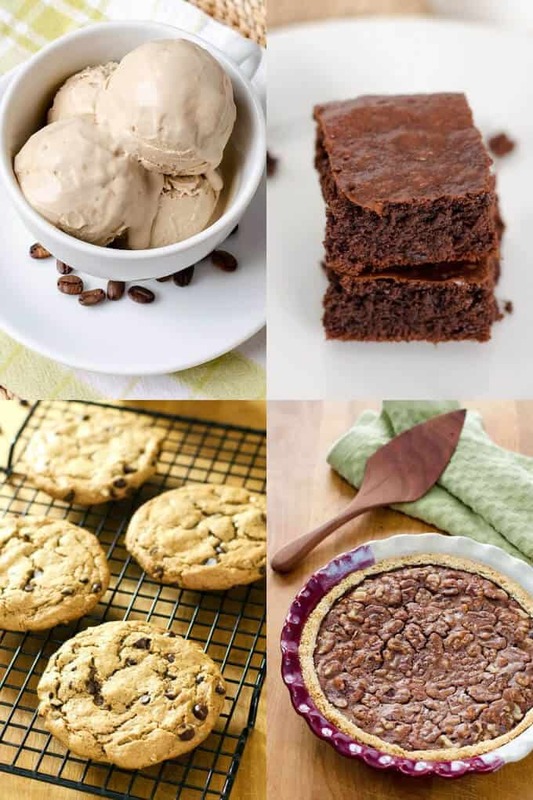 Whether you’re looking for chocolate treats, ice cream, brownies, or cookies, here are the perfect paleo desserts to try when you’re craving a treat. 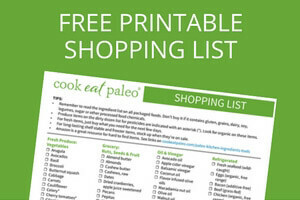 All are paleo and gluten-free, and many are also keto and vegan! I’m a big believer in finding ways to enjoy healthier versions of your favorite desserts because it keeps you feeling motivated to stick to your healthy lifestyle. It’s normal to crave a little treat from time to time. And, frankly, sometimes you just really need a cookie! One of the trickiest things about paleo desserts is navigating gluten-free flours. You’ll surely see many almond flour and coconut flour recipes for paleo desserts, but they certainly aren’t the only options. That said, I really like working with almond flour because of its consistently light and fluffy texture in paleo baked goods. An extra perk? Paleo desserts are a great way to introduce friends and family to your healthy eating choices. Many of my favorite paleo recipes are requested time and time again because they’re really just that good! For example, my family was shocked when they found out that their favorite Thanksgiving pumpkin pie was actually paleo, dairy-free and gluten-free. Now they request that I make that particular pie recipe every year! 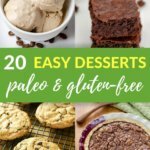 Whether you’re new to paleo desserts or just want a couple of new yummy treats, these are the easy paleo dessert recipes you should try. Your friends and family will never know their eating healthier desserts! Who doesn’t love a little chocolate?! 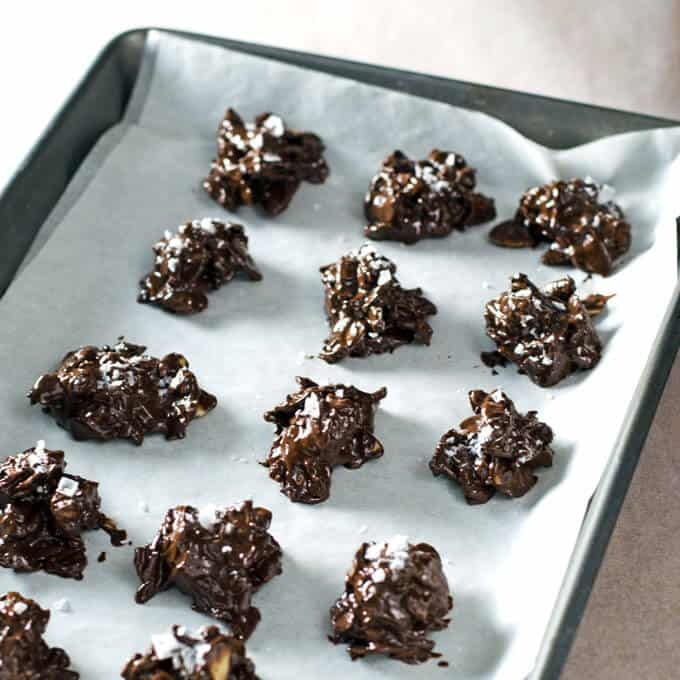 These easy paleo chocolate recipes are a great choice for quick and decadent desserts. Healthy twists on chocolate mousse, pots de creme, brownies and more! 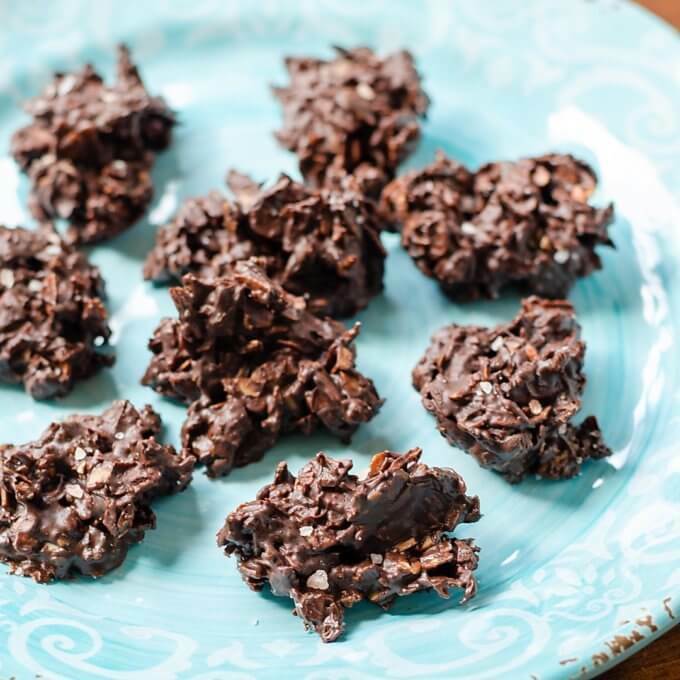 These 3-ingredient chocolate haystacks are an easy treat with a delicious balance of sweet, salty, chocolate and crunch. They remind me of chocolate covered pretzels! This quick paleo dessert requires only 20 minutes to make, and the final result is equally great for snacking and gifting. 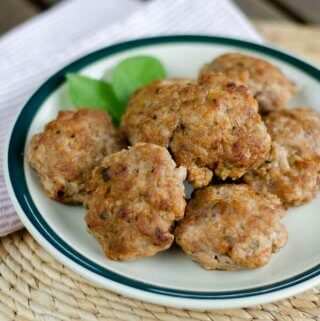 Best of all, this recipe is dairy free, gluten free, keto, low carb, paleo and vegan. It’s a recipe that everyone can enjoy! Chocolate bark is another simple chocolate dessert that can be enjoyed by everyone. This 3-ingredient recipe is dairy free, gluten free, keto, low carb, paleo and vegan. It would make a great homemade Christmas or Valentine’s gift. This treat is wonderful served alongside a scoop of ice cream. I’ve also included some of my favorite flavor variations — like cherry chocolate bark! This ridiculously easy dessert delivers chocolate decadence with a little bit of spice. And it couldn’t be easier to make! Best of all, there’s no whipping required with this easy chocolate mousse. 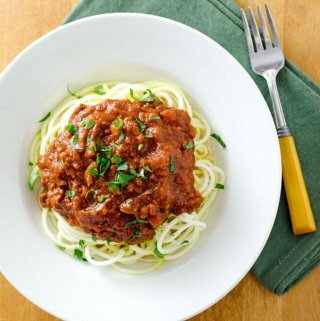 Simply throw all of your ingredients in the food processor and you’re ready to go. You can have this paleo dessert ready in under 30 minutes. It’s perfect for a quick treat or weeknight dessert! These nut-free coconut flour brownies are a great choice if you’re looking for an easy brownie recipe with maximum chocolatey goodness. This one-bowl version is deliciously rich and fudgy without any gluten, grains, dairy or sugar. These brownies are so simple to make. I love serving these alongside some dairy-free ice cream for an easy (and tasty!) paleo dessert. This easy pots de creme recipe is one of those desserts that’s impressive once plated but requires minimal effort to prepare. Unlike traditional recipes, this recipe skips stovetop cooking and tempering. I’ve sidestepped this hassle by making the best use of my ingredients and blender. This is a sophisticated paleo dessert that looks beautiful topped with fresh fruit and whipped coconut cream. These paleo brownies couldn’t be easier — skip the bowl and just throw everything in the food processor! This recipe was originally made using paleo pantry staples in my kitchen, so you probably already have everything you need to make these brownies. This recipe is a breeze to whip up and can be baking in the oven in less than 5 minutes. Try serving them with whipped coconut cream or paleo ice cream. Paleo cookies are great on their own, but also make for a great base in your favorite paleo dessert. Try serving these easy gluten-free cookies on your next dessert platter or as the outer layers of an ice cream sandwich! 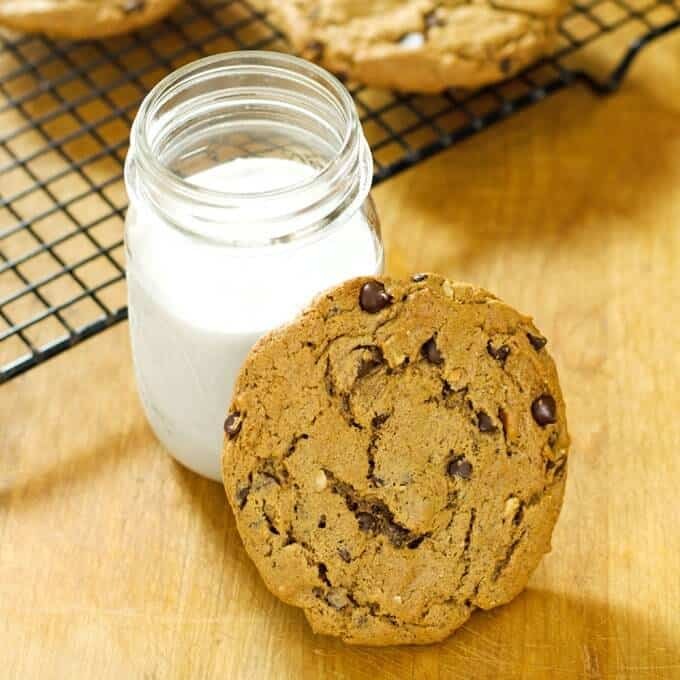 These easy chocolate chip cookies are the best ooey-gooey-melt-in-your-mouth paleo cookie recipe that I’ve come across. These almond butter cookies are a great choice if you need to whip up a quick dessert. They can be made in one bowl and only require 5 ingredients. Your cookie dough can be ready to bake in under 10 minutes and you can have warm, gooey chocolate chip cookies in under 30 minutes! These one bowl cookies are made entirely with pantry staples so you probably already have everything you need on hand. These simple cookies are quick and easy to make — you can even skip the bowl and make the batter in your food processor! I love pairing one of these pecan sandies with an afternoon cappuccino. It’s a delicious healthy snack to have on hand when you're in the mood for a treat that's not too sweet. These nutty paleo cookies are perfectly paired with a cup of peppermint hot chocolate. These cookies are so simple to make and I love that I don’t have to worry about the cookies spreading while they're baking. All of the cookies can be cooked in one go! These are a great chewy and not-too-sweet cookie to enjoy plain, but this recipe also makes a great base for thumbprint and chocolate dipped cookies. Ice cream is the perfect treat on a hot summer’s day…or any day for that matter! These paleo ice cream flavors are the perfect no-fuss dessert when you want something easy and delicious. 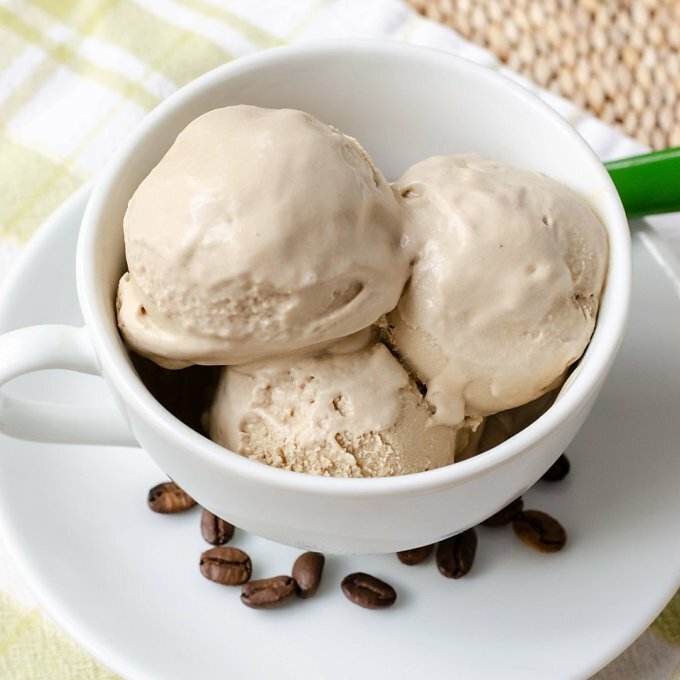 This is the paleo ice cream recipe for anyone who loves coffee as much as me. This creamy dairy-free ice cream gets its rich flavor from extra strong coffee and a touch of maple syrup. It tastes a little like a vanilla latte! And this recipe is so simple — just throw everything in the blender before transferring over to your ice cream maker. There are even a few add-in suggestions to make this ice cream extra special. This pistachio chocolate chip ice cream is the perfect summer treat. It’s a healthy paleo ice cream that gives a nod to a beloved classic ice cream flavor. 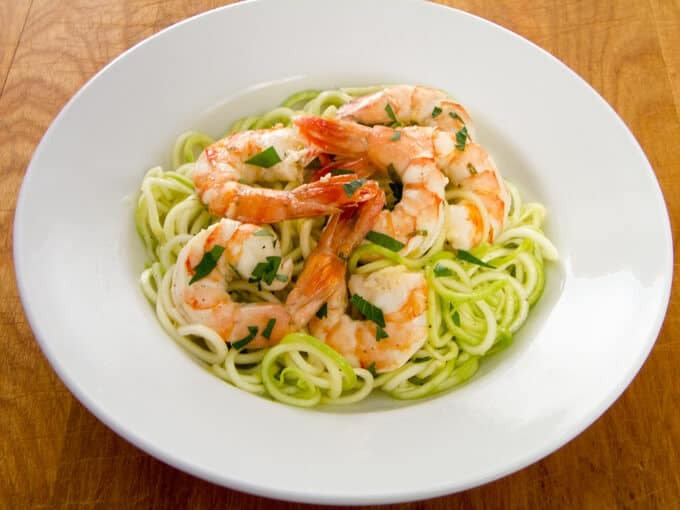 This recipe comes together incredibly quick — only 7 ingredients and less than 5 minutes to make! I’ve even included a few tips on how to get your ice cream base smooth and creamy while skipping all of the traditional dairy products typically found in ice cream. This easy coconut milk ice cream delivers decadent and delicious chocolatey flavor without any of the traditional ice cream ingredients. You won’t find any dairy, sugar or eggs in this recipe! I love that this recipe is simple to throw together — all the ingredients are tossed in the blender and then moved over to the ice cream maker. Want to kick this ice cream up a notch? Try adding in paleo brownie bits or some vegan cookie dough! These are some of the easiest paleo pie recipes around. Whether you’re looking for the perfect paleo pie crust or a simple homemade pumpkin pie, these are the dessert recipes you need to bake for your next family gathering! This is an easy and versatile gluten-free pie crust that’s great for either savory or sweet fillings. I love that this recipe requires just 3 simple ingredients and absolutely no rolling whatsoever. This quick almond flour pie crust is also keto, low carb, paleo and vegetarian. Best of all, it can be ready to fill in just a few minutes. Your pie will be ready in a flash! You need this pumpkin pie in your recipe rotation during winter holidays, like Thanksgiving and Christmas. 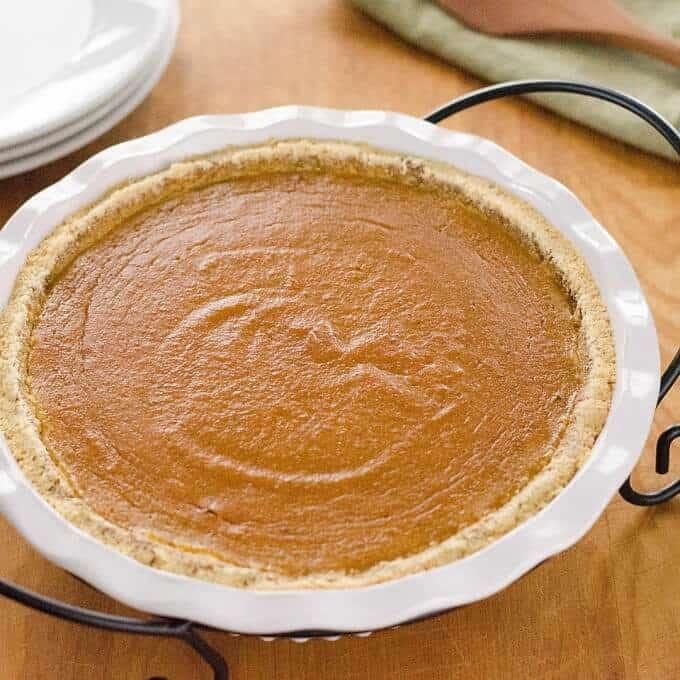 This healthy pumpkin pie is quick, easy and absolutely delicious. The crust is made in your blender with just 2 ingredients and I’ve included a couple of tips for choosing the right pumpkin puree filling. It’s so good that this is the pie my family requests every year for our Thanksgiving dinner! I love this combination of peach and blueberry flavors, but you could easily substitute any of your favorite fresh seasonal fruits. 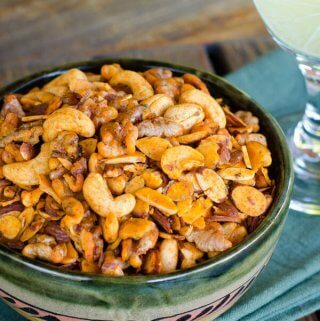 This is a simple crisp recipe that’s naturally sweetened. It really doesn’t need anything extra, but you can try topping it with whipped coconut cream or dairy-free ice cream if you’re craving an extra treat. This chocolate walnut (or pecan) pie is the recipe I turn to every Thanksgiving and Kentucky Derby. I always make the pecan variation for the derby, but I'll usually opt for walnuts during the winter holidays. I love that this easy pie recipe requires only 10 minutes of prep time and you can be enjoying this delicious chocolatey gluten-free treat in under an hour! And for an even faster blender version, try my chocolate pecan tart. Here are a few more delicious paleo desserts to consider serving to your friends and family. Many of these make use of fresh summer fruit and would be the perfect addition to your next backyard cookout. Coconut whipped cream is the perfect topping for so many paleo and keto desserts. It’s easy to make and perfect for keeping your treat dairy-free. Simply skip the honey if you’re following a keto or vegan diet. You’ll also love the tips on troubleshooting your whipped coconut cream if you’re wondering how to get consistent results every time! This easy paleo dessert is the perfect showcase for fresh summer fruit. I love serving it on July 4th, but it’s truly a great no-bake dessert no matter when you choose to serve it. 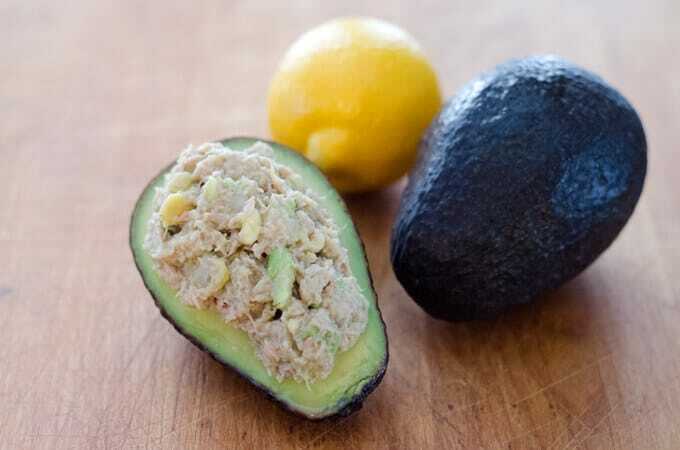 With just 3 simple ingredients, this recipe is quick and easy to make. Best of all, it can be enjoyed by everyone. It’s AIP, dairy free, gluten free, keto, low carb, paleo, vegan and Whole30-friendly! 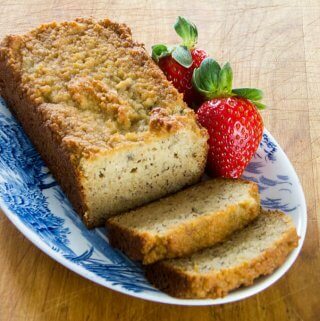 This is the banana bread recipe you should turn to when you’re craving your favorite coffee house recipe. Using only a handful of simple ingredients, the final result is a moist and tender loaf that gives a nod to your favorite comfort food treat. If you’re serving this paleo quick bread for dessert, try adding dairy-free chocolate chips to your batter. This recipe freezes well too! You can’t go wrong with a healthy twist on this classic summer dessert. This healthy strawberry shortcake is the perfect paleo dessert to try if you have too many fresh strawberries (is there such a thing as too much?). 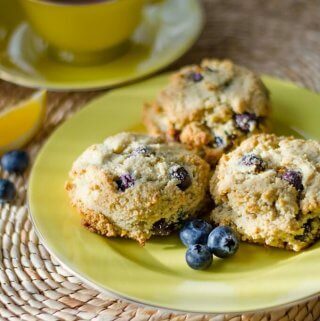 You can even bake and freeze the shortcakes in advance, which makes assembling a breeze. Top with whipped coconut cream for a fresh and decadent treat. Looking for more paleo and keto desserts? These 30 Delicious Keto Desserts are the perfect way to sweeten your day. Many of these recipes are also vegan!